I know there are plenty of versions of this soup out there on the internet. This happens to be my mother’s version that she created, and let me tell you, if it comes from my mom, you KNOW its going to be good! This soup is healthy and flavorful. It is super delicious and a great way to get some much needed veggies while warming yourself up this winter season! Definitely give this soup a try! You will LOVE it! A healthy and flavorful dinner that is SO delicious! Sauté carrots in olive oil until almost tender. Add onions and sautee for another two minutes. Add tomatoes, broth, bullion cubes, basil, Italian seasoning and red pepper flakes. Bring to a boil and add pasta. Cook on medium heat for about 15 minutes. Add beans and spinach. Cook for about two minutes and serve. Top with fresh grated parmasan. Yum! Your soup looks just fantastic!!! Perfect for this chilly weather! What a beautiful photograph! 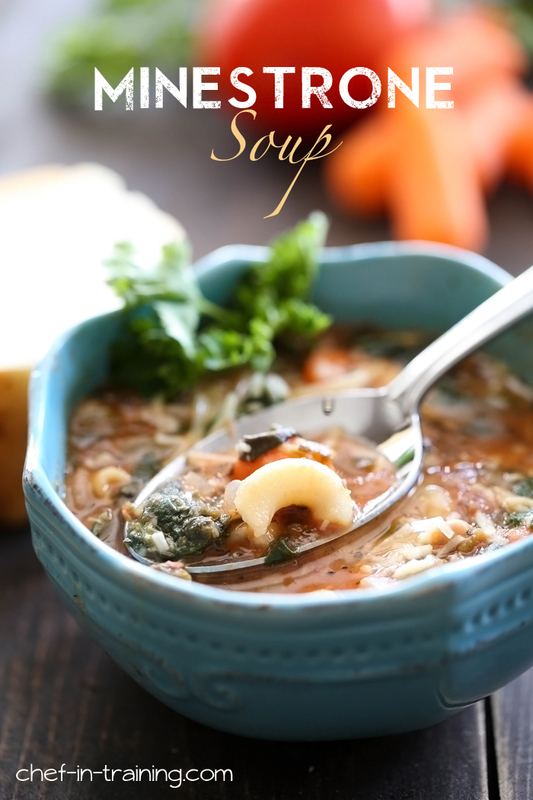 This soup looks warm and inviting on such a cold winter day! Yum, can't wait to try this. I have loved all of your moms recipes. Between the two of you, I have got to figure out how to get an invite to Sunday dinner! Great picture! Made this, it was incredible!! Thanks for the recipe. We made this last week. It was really good! I used chopped fresh spinach and that worked well. Sorry this recipe isn't up either :( neither was your zucchini pancake recipe. I have 2 girls and am expecting my 3rd one come July. So you can imagine how full my hands will be. That's why I was ecstatic to see your "30 minute dinner" section. Unfortunately many of the recipes aren't coming up :( and alllllll your recipes are making me drool because they sound and look so good!